I am so excited to be back blogging today and introduce you to the new company, Sofiona Designs! The company was just opened and it is run by two Canadian friends, Sherri Herrera and Trisha Yanke. They have four patterns so far, and I love all of them, but as soon as I saw the Raven Dress, I knew I had to try it first! One reason I am super excited for this new company is because Sherri and I were on Project Run and Play together last year. The competition was the starting point of her starting this company and I am so happy for her. I can't wait to see where they go with this new adventure. The Raven can be made as a dress or a shirt. It has a dropped shoulder and scoop back with a few different options for he back. I chose the raised scoop back for this version. 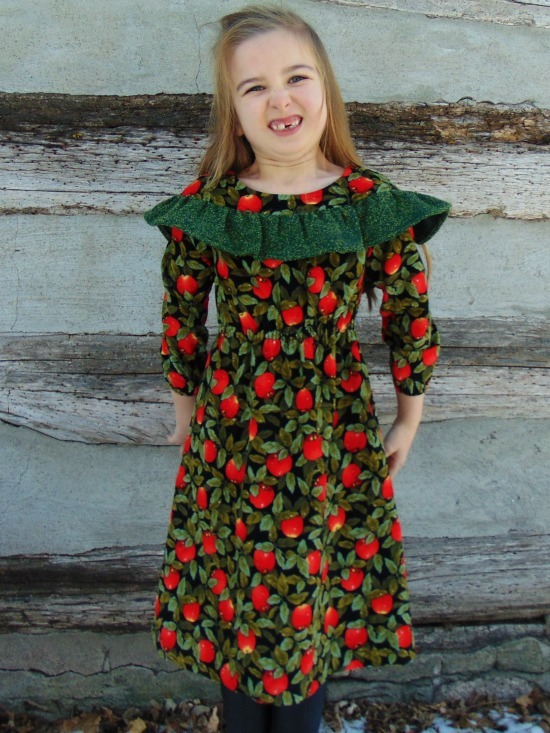 The ruffle can be long or short or omitted. The dress has an elastic waist and comes with three different sleeve lengths. It was designed for woven fabrics, but knits can be used for the dress. I just love the back view and the ruffle! I wasn't sure about these two fabrics together, but I love the final result. If I had to do it again, I would find a different fabric for the ruffle because the one I used is a bit too heavy weight for gathering. I made it work though! 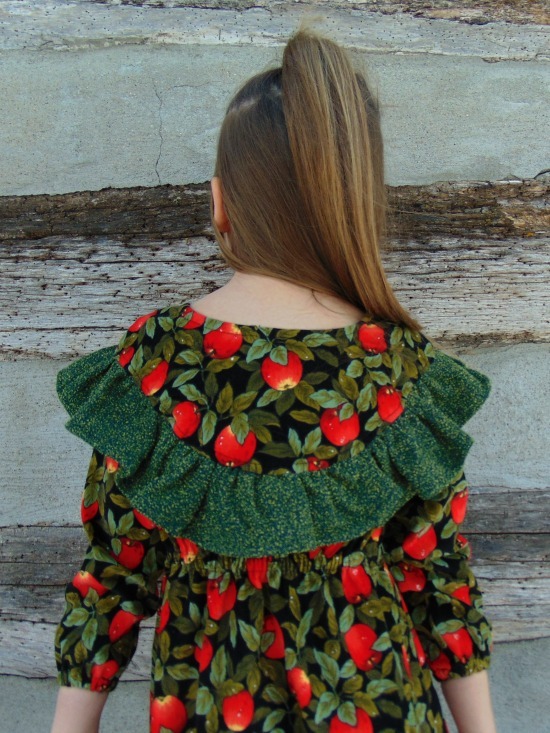 The apple fabric is a corduroy and both fabrics are from my stash. This is technically my muslin version. I typically don't make muslins, but I'm glad I did! I made a size five, since that is where my six year old sister's measurements put her in the size chart. I did lengthen the dress by four inches because she is tall. I did not think to lengthen the sleeves and as you can see they are much too short! I told her she has gorilla arms, and she just laughed! It's still cute and she will wear it, but next time I would lengthen the sleeve by a few inches. 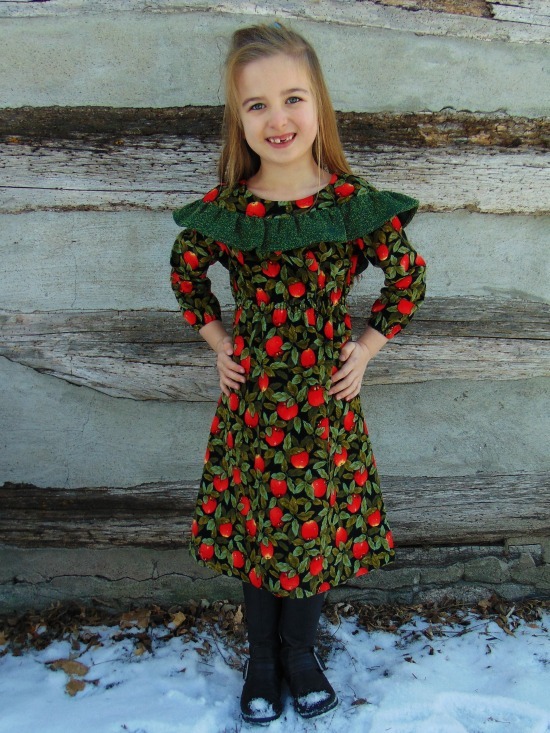 I just love this dress pattern and can't wait to make more for my sister! I'm planning on using a knit and making her Christmas dress with the Raven. I'm also excited about the other patterns in the shop and I can't wait to make the Artic Fox Housecoat. If you are interested, you can join the Facebook group and follow Sofiona Designs on Instagram. They are running giveaways on both Facebook and Instagram. This post is not sponsored in any way and I bought the pattern myself. I'm just super excited about the company and wanted to share! 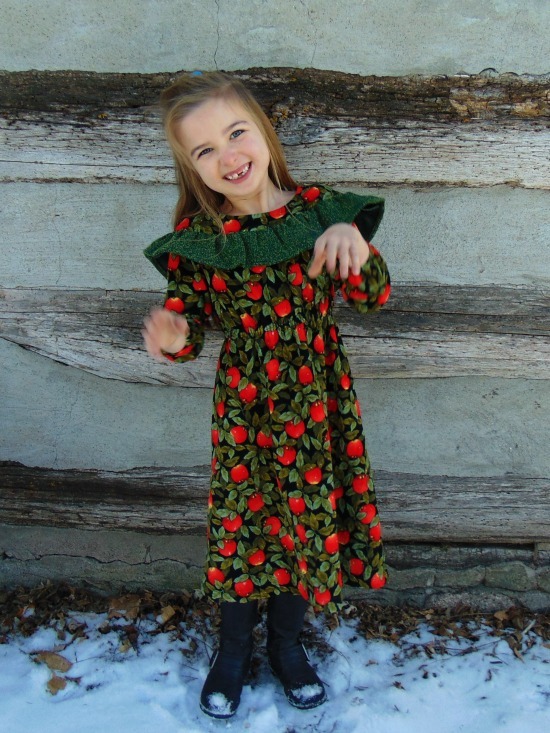 All patterns are marked down 30% off through November 25th as well. Now for some outtakes! It is more difficult than one would imagine to take pictures of a six year old! Hope you enjoy these silly pictures! In this one, she was shaking her hands, saying "my hands are cold!" I am back to blogging with my new favorite dress! 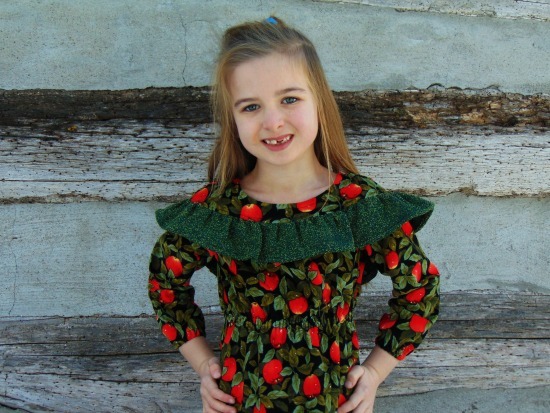 This is the Chai Shirt and Dress pattern from Itch to Stitch Designs. I made a wearable muslin of the shirt version at the beginning of the summer, but I've been wanting to make the shirt version ever since I first found the pattern last year! This dress has been in my mind for three years. I was fortunate enough to win a gift certificate to the Cloth Pocket three years ago and used it to buy this beautiful chambray fabric. I knew I wanted to make a shirt dress with it, but it took me until last year to find the perfect pattern. I've been wanting to make the Chai pattern all summer but kept putting it off with other projects and procrastination. I finally cut out my pattern pieces at the beginning of this month and sewed it a few days ago! The cutting part took me the longest (as it always does) and it only took me three days to sew it. So, after three years, I finally have my chambray shirt dress! I made a few changes to this pattern before cutting it out. My measurements put me in a size 4 for bust, a size 6 for waist, and a size 8 for hips. Based on the finished measurements, I decided I needed to grade out for the hips, but I decided to use the size 4 for my waist. It is a perfect fit and I am happy with my changes! I also lengthened the skirt by 6 inches because I am taller than the pattern is drafted for and I like my skirts to hit below the knee. The dress is definitely more fitted than other shirt dresses I have made, but I love the style. 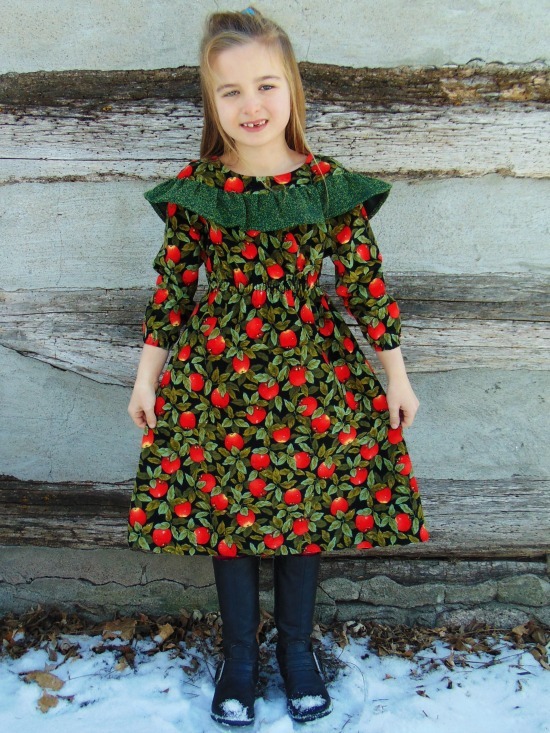 I think it would look great with a circle skirt too! The Chai has gathers at the bust instead of darts and I love the detail it adds! The dress also has huge inseam pockets, which I love! I rarely make a skirt or dress without pockets anymore! I can see this dress being perfect almost year round. It will be perfect for spring and summer as is and I can layer it as we head into fall. It was a chilly morning when I took these pictures, but with tights and boots I was comfortable! If it was colder, I would add a cardigan as well. The only changes I made during construction were to interface both the upper collar and the under collar. The pattern only calls to interface the under collar and the collar stands, but I wanted to interface the upper collar too. I think it makes it more crisp and helps it stand up more. The buttonholes are never my favorite part to sew, but my machine was cooperating with me and I didn't have to seam rip any of my buttonholes! They are not perfect, but I am happy with how they turned out. Hello! 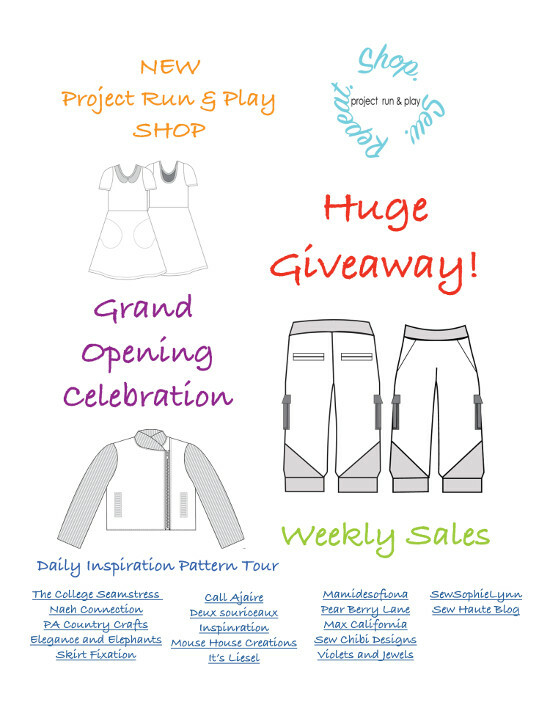 I am so excited to be part of the grand opening tour for the new Project Run and Play shop! If you haven't already heard, Project Run and Play just opened a shop where you will be able to purchase the designs from past PR&P looks. The grand opening event takes place all month long with a different theme each week! This week's theme is dresses! The shop is one of a kind as you will be able to find patterns created by previous Project Run and Play designers during their season! No other patterns will be sold here. It is an awesome opportunity for those designers! The shop is opening with 17 different patterns from previous Project Run and Play designs. 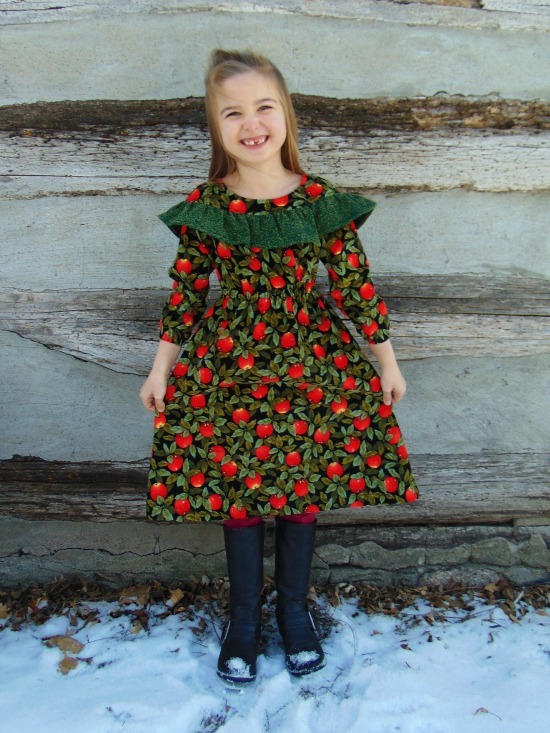 There are many more patterns that will continue to be added to the shop as well! 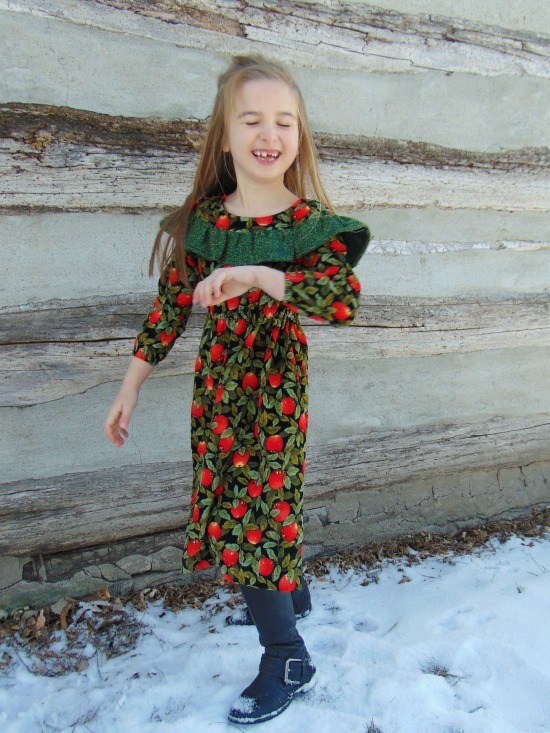 Today, I have the honor of showing you the Sydney Pinafore by Haley of Mouse House Creations. This design was first seen in Mini Season 1 of Project Run & Play. You can find it here in the Project Run and Play shop. The Sydney Pinafore is a classic pinafore style dress with a bib front, straps that criss cross in the back, and a flat front skirt. The pattern also comes with an option for shorts or bubble shorts. It is a perfect style for a little girl to run around in and it can take you through all the seasons as it's perfect for layering! The fabric recommendations for the Sydney Pinafore are chambray, fine wale corduroy, cotton wovens, linen, and any stable woven fabric. I have some corduroy in my stash that would make the perfect fall pinafore for my sister. However, since we are now in the summer season, I wanted to use something a little lighter. I thrifted this shirt dress a couple years ago, and I've only worn it once even though I love the fabric and the design. It was too short for me, but I was inspired to turn it into something new! The Sydney Pinafore was a quick and easy sew! If you are a beginner, it would be a perfect project as well and Haley's instructions are clear and easy to follow with lots of pictures. I love the criss cross straps and elastic back! You may remember the pinafore dress I made a few months ago for the PR&P sewalong. My sister informed me that "I don't like wearing that one because it's too hard to get on." Haha! At least she is honest. The Sydney Pinafore was much easier for her to get on and with a little help with the buttons, she could dress herself. Pockets are a must for every girl! Miss V is super excited about her new pinafore dress! I hope she gets lots of wear out of it this summer. It is a great style for little girls like her who are always on the go with never ending energy! I also could not resist making the bubble romper version of the Sydney Pinafore. I think that style looks so cute on babies! I was in luck, because my cousin is expecting a baby girl in August. I made the 0-3 month size in a cotton fabric from my stash. You can make the bubble romper with or without a placket. I made it with the placket to make diaper changes easier. I'm so excited to see her wearing it soon. I don't know if there's anything cuter than babies in handmade clothes! Be sure to go check out the new Project Run and Play shop! You can find the Sydney Pinafore here. 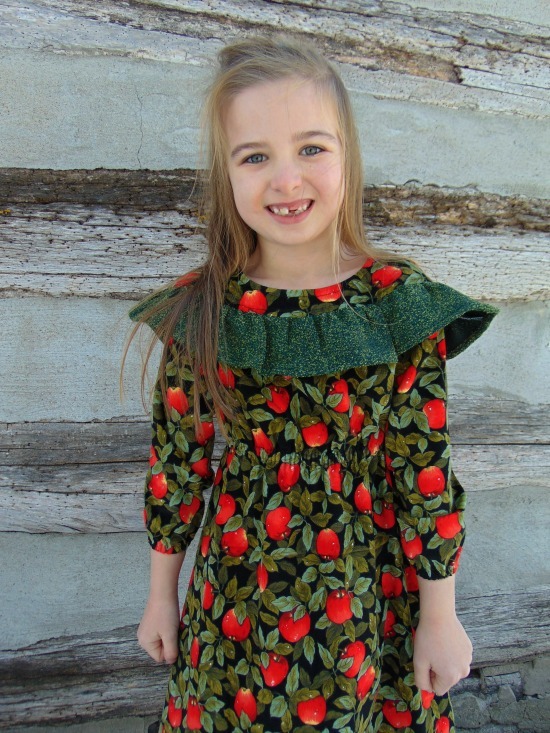 Since this week, July 9-15 is "Dresses" week, all dress patterns will be marked down by 20% with no code needed! 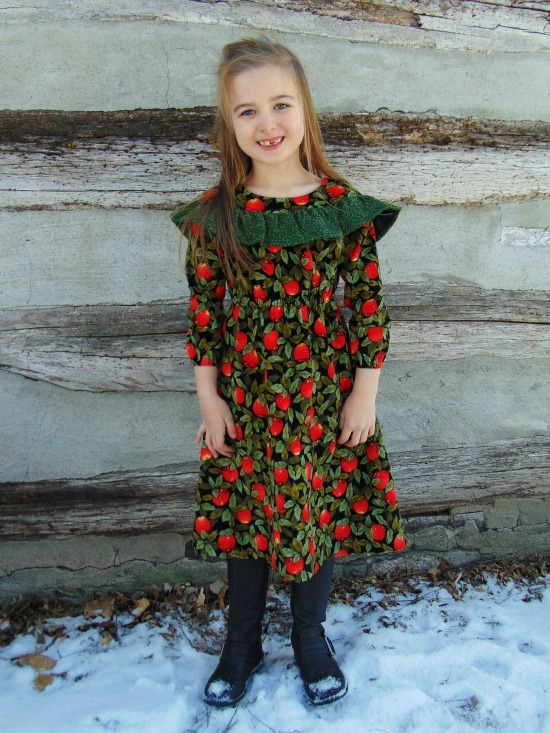 Be sure to take advantage of this discount as there are so many great dress patterns in the shop! 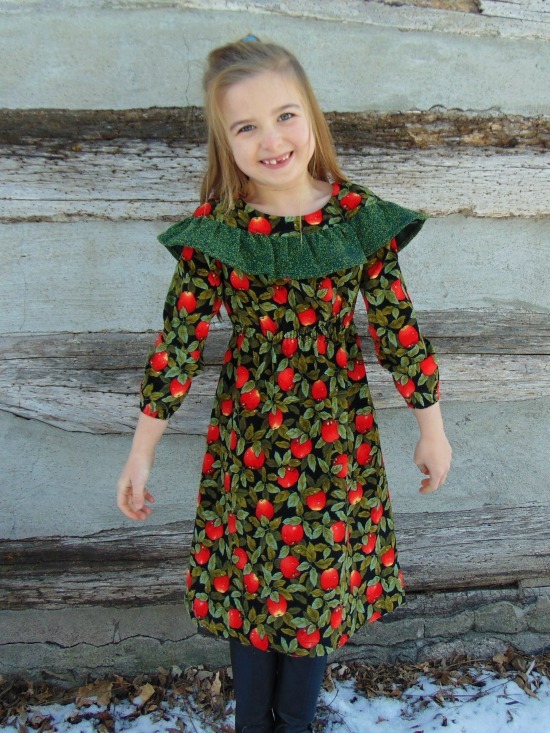 Another one of my favorites (and tried-n-true pattern) is the Janie dress also from Haley! Be sure to stay tuned to the Project Run and Play blog for more great bloggers on the tour all month long! Again, you can find the new shop here! Finally, there is a giveaway with five winners! Be sure to enter below! You will have the chance to win either a $50 gift certificate to DH Fabrics and Co and patterns from the new shop! This must be the year for woven, button up shirts! This one is a new-to-me pattern though and perfect for summer. The Chai Shirt and Dress pattern released last August, and I wanted to make it in the dress version as soon as I saw it. I ordered the pattern right away and since I had the perfect chambray fabric for the dress, I decided to make a muslin (something I never do because I'm a lazy sewist). I used this cheap woven gingham and cut out my muslin, but it sat in my sewing room nearly forgotten for almost a year! I decided this past weekend that I was going to sew up the muslin, so that I can make my dress to wear this summer. However, instead of sewing up just a quick muslin to check the fit, I made the entire pattern. I'm glad I did because it is a great fit and completely wearable! I also will be more familiar with the pattern the next time I make it and hopefully that means less mistakes! The Chai Shirt and Dress is such a classic style and exactly what I was looking for in a shirt dress! The pattern includes cup sizes, which was something new for me. It has the options for dress or shirt length, a classic collar with collar stand, options for sleeveless or short sleeves, a button placket, and an a-line skirt. The fabric is originally from fabric.com from quite a few years ago. It is not the highest quality of fabric, but it worked for checking the fit! I actually really like the colors and I happened to have red buttons in my stash, and I think it makes for a great Fourth of July themed outfit. This might be one of the best fitting woven shirts I have made. The back fits really well! I didn't make any changes to this version, and since I like how it fits I plan on not changing anything for my dress version. I will probably add length to the skirt, but that is something I always have to do with dress patterns. My button placement could use some work, but buttonholes are not my favorite thing to do, so I am happy with how they turned out. I didn't have to seam rip any buttonholes this time, which is unusual! I think this shirt will be a great addition to my summer wardrobe. However, this black skirt is the only thing I have to match, so I might have to change that! My sister was my photographer this time and I think she did a great job! Me-Made-May 2018 has come to an end! It's hard to believe that this was my fifth year participating (and the whole challenge has been going on for nine years!). I posted my outfits on instagram, but I am going to do a quick wrap up here too. I managed to wear handmade everyday that I was not working and I repeated some pieces, but not entire outfits. From left to right: Day 1 was my Cheyenne tunic and dropped waist Sybil skirt. Day 5 was my brushed poly Union St. Tee and Veronika Skirt. Day 6 was my Madeline Maxi dress and Julia cardigan. Day 7 was my Lady Skater dress. On day 9 I wore a short sleeve day tripper top with my Blackwood cardigan, route 66 skirt, and Avery leggings. Day 10 was a Fringe blouse and double gauze tiered skirt. Day 11 was a Marigold dress and Avery leggings. Day 13 was my new Joy Jacket, a day tripper top, and a Sybil pencil skirt. On day 15 I wore a Union St. Tee and knit a-line skirt. Day 16 was a Shoreline Boatneck and linen Street Fair skirt. Day 18 was another Lady Skater dress. Day 19 was another version of the Union St. Tee and a knit a-line skirt. Day 20 was my rayon Fringe dress and my Blackwood Cardigan. Day 21 was my favorite Daytripper top and denim route 66 skirt. Day 25 was my Union St. Tee with my Gabrielle Godet skirt (the oldest make I wore this month!). My sister is wearing a Oliver & S Hopscotch skirt made by me. Day 26 was my Wildflower Top and another version of the Street Fair skirt. Day 27 was one of my favorite outfits - my Felicity dress, Julia cardigan, and a handmade scarf. Day 30 was a Lane Raglan and knit a-line skirt. Finally, on day 31 I wore my Wildflower top again with my Sybil pencil skirt (loved this outfit too!). As you can probably tell, there are some skipped days. That just means I was working that night or the night before and spent the day sleeping. I wore me-made pajamas though and I have a few me-made long sleeve Union St. Tees for wearing under my scrubs. The weather made the month of May hard too. We didn't really have a spring. It seemed as though we went right from winter to the middle of summer with temps getting as high as 90 degrees. There were a few cooler days thrown in and you can see with my outfits how the weather was bouncing around. There are quite a few things I did not end up wearing (mostly my winter clothing). I also noticed that a lot of my clothes are from 2013 and 2014. I still wear those clothes quite a bit and it just goes to show that handmade items can last a long time! My least favorite part of the month was taking a picture everyday because on most days I did not have a photographer and there is not good lighting in my apartment. That is not the main reason for the challenge, but I am glad I took pictures so I can look back on my outfits! I will continue to wear my handmade clothes, because those include some of my favorite things to wear. It's fun to see how far I have come since the first year I participated in me-made-May. I have entered into the world of sewing menswear! If you had told me a year ago that I would be sewing a flannel plaid button down shirt for my brother I would have thought you were crazy. In fact, once this brother of mine said, "You should make me a flannel shirt," and I just laughed! I have sewn two other men's patterns in the past year (both t-shirts, one for this brother and one for my dad). I enjoy sewing plaid shirts for myself, so I thought it would be fun to venture out and attempt to sew one for my brother. I found the fabric first (on sale for $3/yard at Cali Fabrics) and then I read some reviews on men's shirts. Obviously, I decided on the Liesl and Co. All Day Shirt. It had good reviews, I liked the casual style, and I have had good luck with other patterns from this company. This pattern was very well written and I learned so much! I have made plackets and collars before in shirts for myself but there were different techniques used in this pattern. It was a good challenge for me to try something new and learn some new skills in the end. This a straight medium with no changes made to the pattern. I am still learning about fitting women's patterns and men's fitting is a whole different ballgame! I decided to just go with the pattern as is and see what happens (which is what I usually do in my sewing anyway)! I am not too experienced with fitting, but I think it is a pretty great fit right out of the package! My brother's measurements put him in a size medium. However, I think his neck size is slightly bigger than the medium size and that is something I would change for next time. He is not able to button the very top button on the collar, but he informed me that this does not matter since he never buttons that button anyway. Check out that placket! I'm super happy with my matching skills here. I was trying to make it work when I cut out the pattern, but I wasn't sure if it work in the end. I am really picky about matching plaid because RTW shirts almost never match. I'm happy to say that the sleeve placket matches nearly perfectly on both sides. I also liked the method used in the pattern. As much as I love matching plaid, I'm also a lazy sewist and that's why I chose to cut the yoke on the bias! However, I think cutting on the bias adds interesting detail too! I cut the yoke, pockets, and cuffs on the bias for this shirt. I know you can't see the shirt well in this picture, but I thought it turned out pretty neat! As much as I like sewing for myself, I enjoy sewing for my siblings too! I think plaid shirts are on my list of favorite things to sew too (since this is the third one this year including the ones I made for myself)! It's not a quick and "easy" project, but it is so satisfying once you are finished. Have you sewn any men's patterns? Hi! Welcome to my blog! I'm Elizabeth - a girl in her twenties who loves to sew. When I'm not working or spending time with friends, you can probably find me sewing. I love taking a flat piece of fabric and creating something I can wear! Other things I enjoy are baking, reading, writing and running.